Casino Enterprise Management magazine's 4th annual 'Slot Floor Technology Awards' was the biggest yet, drawing more than 47 nominations. 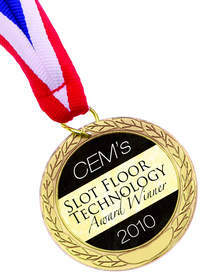 FARGO, ND--(Marketwire - April 19, 2010) - Casino Enterprise Management is proud to announce the 10 winners of its Fourth Annual "Slot Floor Technology Awards." This was the biggest year yet in the competition's four year run, drawing a record 47 products, nominated from 18 different companies. Casino Enterprise Management Publisher, Peter Mead, said, "This year's awards truly show how hard this industry is working. The advancements in technology are amazingly impressive. Thank you to everyone who contributed to another year of great gaming innovation." A panel of expert judges was assembled and tasked with combing nomination materials to decide the top 10. These judges were: Buddy Frank, VP of Slot Operations, Pechanga Resort & Casino, Temecula, Calif.; Chuck Hickey, VP of Slot Operations, Barona Resort & Casino, Lakeside, Calif.; Ralph Margolis, Director of Slot Operations, Mystic Lake Casino & Resort, Prior Lake, Minn.; Philip Trofibio, VP of Slot Operations, MotorCity Casino, Detroit, Mich; Michael Tomasello, Director of Slot Operations, Palms Casino Resort in Las Vegas; and Paul Tjoumakaris, Senior VP of Gaming Operations, Seminole Gaming, Hollywood, Fla.
An in-depth article highlighting the winning products will be featured in the May 2010 issue of Casino Enterprise Management. For more information, visit www.CasinoEnterpriseManagement.com.